Instant Pot vegetable biryani is made by pressure cooking rice, vegetables in a spicy onion-tomato gravy to create this flavorful one-pot vegetarian meal that comes together in under 30 minutes. What is the difference between pulao and biryani? 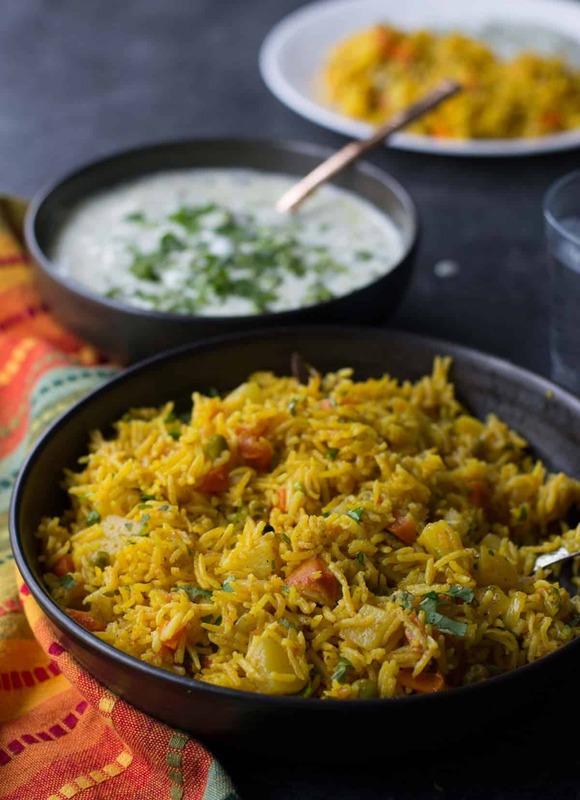 There are many debates on how pulao and biryani are different but the main differences would be the cooking technique and spice use. Technique – While making biryani, rice and vegetables/meat are partially cooked separately and then they are layered and cooked over a low flame to allow the flavors from the meat/vegetables to meld in. In the case of pulao, vegetables (and/or meat) are sauteed first and then rice is added in along with water and then cooked together. Use of spice – Biryanis make elaborate use of spices, involves marinating the meat and is definitely more flavorful, aromatic and more of a gourmet meal than the humble pulao which is typically light on spices and considered an everyday fare. 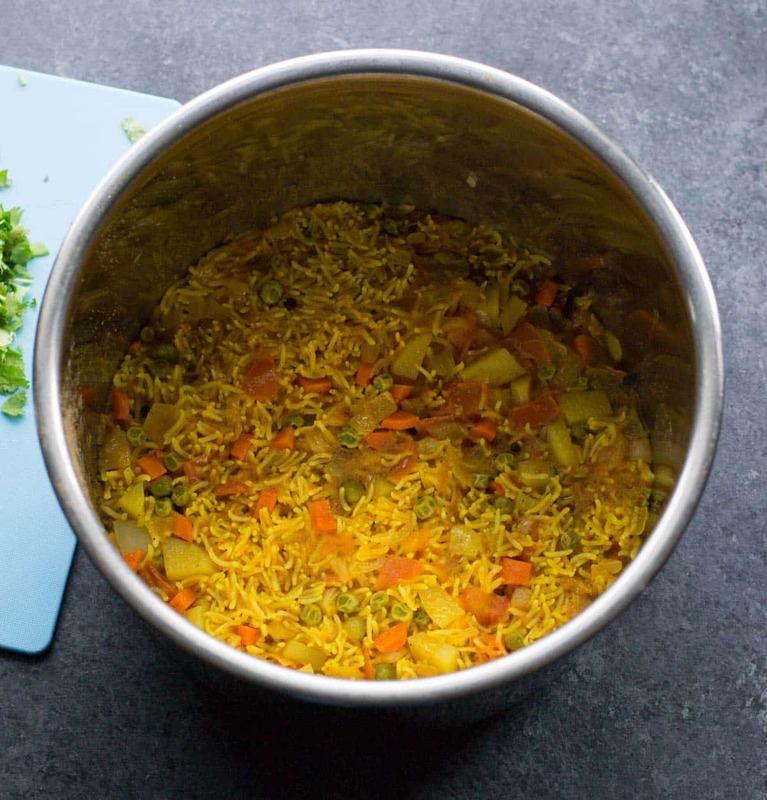 Isn’t this one-pot vegetarian rice recipe a pulao recipe? Yes, it is. But no one needs to know. When you open the lid of the Instant Pot, the aroma from the biryani will fill up the room. 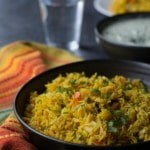 One bite of this flavorful layered rice dish will convince any fastidious non-believers that it is indeed vegetable biryani. 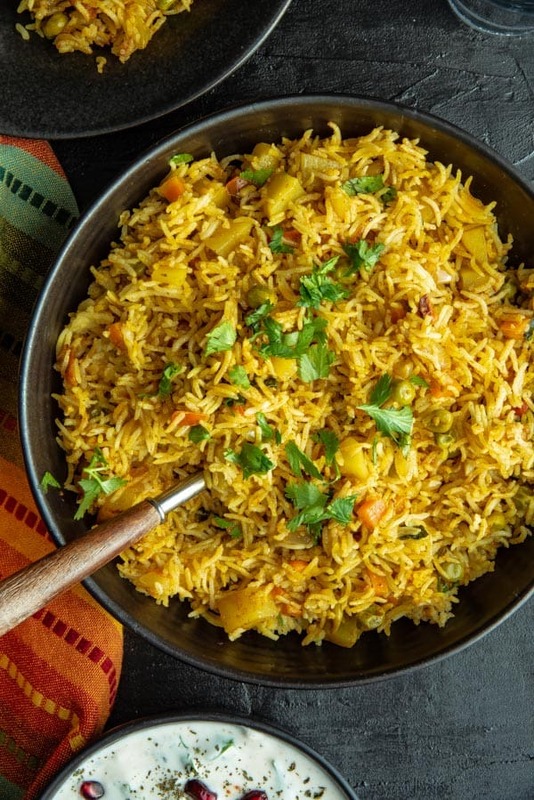 How to make Instant Pot Vegetable Biryani? If you haven’t used your Instant Pot yet, making veg biryani would be an ideal way for you to get started. It is an easy, fail-proof recipe and needs little hands-on time. And the result is so flavorful just like how a biryani should taste. It requires very little hands-on time and is perfect for busy mornings when you are juggling a million things. Make sure to chop the ingredients the previous day, and you’ll have this delicious tasting veg biryani in no time. Pair it with raita for a complete meal. Add garlic and saute it with the onions for a minute or so. Add the veggies (potatoes, carrots, and peas) along with turmeric powder, chili powder, and salt and fry them for another 5 minutes or so and then add tomatoes. Saute the tomatoes till they are soft (approximately 5-8 minutes). Whisk the yogurt well with garam masala and add this mixture to the Instant Pot. Do a taste test - the salt should slightly be on the higher side. Drain the water from the soaked rice and add the rice on top of the veggies and add just enough water (approximately 1-1/4 cup) to completely submerge the rice. Press “Warm / Cancel” button and then select “Pressure Cook.” Adjust the time to 6 minutes and set the pressure selection at low. Cover the Instant Pot lid and lock it. Make sure the vent is at sealing position. Once the cooking cycle completes, the Instant Pot will switch to the Warm cycle. Press the Warm/Cancel button and carefully release pressure. Open the lid and let the steam escape. Add a tablespoon of ghee and wait for 5 minutes before fluffing the rice and mixing in the ghee. Garnish with coriander leaves and gently mix before serving. We made this recipe tonight and while the flavor was good the rice was a mushy mess. We threw it away and went out. I might use this recipe again but not in the instapot! Hi Paula, I am so sorry that the biryani didn’t come out right. It is never fun to throw out food. I have made this recipe a minimum of 50 times to know that it works. Instant Pot makes it so easy and is such a time-saver. I would love for you to have the same experience. So, allow me to help you troubleshoot this recipe. I have a few questions for you that might help me understand what went wrong – Did you make any changes to the recipe? Did you use just enough water to cover the rice? How long did you cook?. Looking forward to hearing your response. Also, there is a savory dish which is made from mushed up rice called as Khichdi or rice porridge. It is almost made like a biryani but with the addition of lentils. You could have salvaged your dish by serving it with a side of yogurt and some Indian pickle. I am linking that dish here – https://simmertoslimmer.com/moong-dal-khichdi/ so you know what I am talking about. I have the older Instapot IP-Lux which is missing low pressure setting. any tips how to get by? Hi Ashu, Folks have used high-pressure setting with similar results. Don’t stress about it. There isn’t any significant difference in the end result. How much water would I add in the IP if I want to make this for 2 people. I know recipe calls for 4. Thanks! Hi there! For 2 cups of basmati rice, I add approximately 1-1/4 cup water. The goal is to have the rice grains just about submerged. If you are making this biryani with 1 cup of rice, I would suggest starting off with 1/2 cup water and add water in small amounts until the rice is just about covered. Does that make sense? My husband is allergic to milk products – can you recommend any substitutes for the ghee/yogurt? Can I use coconut oil? Thank you! You can definitely use coconut oil! Made this last night and my husband and I loved it. I would like to add an extra cup of vegetables but don’t want to reduce the flavors. What spices would I increase and by how much? I would probably just add a tablespoon of yogurt and 1/2 a teaspoon of garam masala to get started. Do a taste test – if you want to add more warmth to the dish, add garam masala in 1/2 teaspoon increments. The whole spices don’t need to increase. Increase the chili powder if you want to make it spicier – again in 1/2 teaspoon increments. Are you planning on adding more rice as well? This biryani proved to be a lifesaver on a busy working day. I used a small bag of organic frozen vegetables to cut the prep time short. It turned out perfect and I paired it with some leftover dal makhani to make a deliciously satisfying meal for the family. That’s such a great idea, Deepti! Thanks for stopping by.